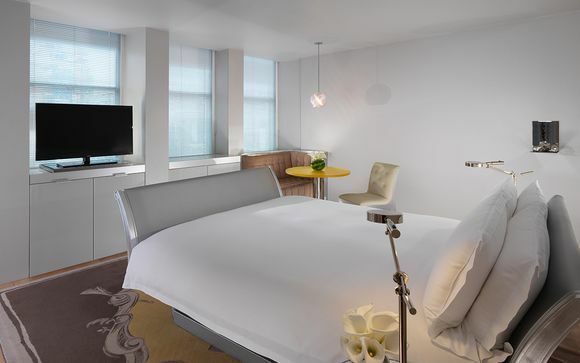 This landmark 1950s building is ranked within the top 4% of London Hotels on Trip Advisor, and features cutting edge Philippe Starck design, a state of the art Spa and a stunning Courtyard Garden. It boasts an incredible central location - just behind Oxford Street, in the heart of the West End. Our members can enjoy a stay in a Superior Room in the heart of London. This fantastic 5-star hotel is situated in London's West End, just a short walk from Oxford Street. This ideal location is perfect for easy access to central London's major attractions. Oxford Circus, Tottenham Court Road and Goodge Street Station are all roughly equal distance away and merely a 5-minute walk. Luckily for guests, you're never too far from seeing the best London has to offer. A 2-minute walk will take you to world's busiest shopping street (Oxford Street) where you will find countless shops ranging from high-end designer stores to typical high street chain stores. Regent Street and Old Bond Street also offer further fantastic shopping opportunities. 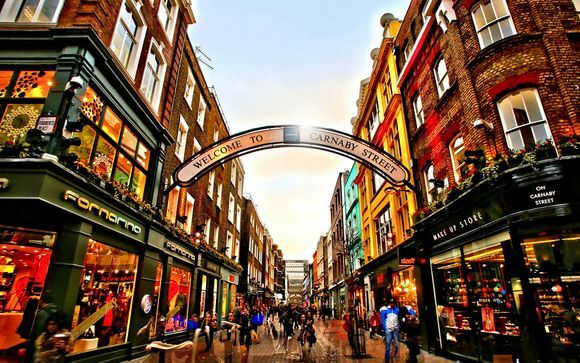 Also within comfortable walking distance are the districts which make up the West End - Soho, Covent Garden and Piccadilly. Here you will find Leicester Square, Trafalgar Square and Piccadilly Circus, all of which provide London's finest restaurants and entertainment. Theatre Land, stretching through Soho, offers most of the world's most famous plays and musicals. A lavish "Urban Spa" in the heart of London’s West End, Sanderson offers a retreat from the bustle of the city into a world of fantasy and well-being. Designer Philippe Starck has left his mark on The Sanderson, giving it his own personal touches of whimsical style and elegant décor. This innovative boutique hotel is a 1950s building which has been refurbished with floor to ceiling glass walls, artwork by Dali, and a wonderful mix of baroque and modern styles embellish the hotel's interior. The Restaurant at Sanderson blends visionary design with an exceptional menu and artisanal cocktails, whilst the Purple Bar - with its veritable symphony of purples, lavenders and violets - is a chic and intimate lounge that has become one of London’s hottest gathering places. Guests can also drink or dine in the private Courtyard Garden, a lush open-air oasis brimming with flowering trees, fountain, mosaics and a reflecting pool. These striking hotel rooms imaginatively blurs the line between extravagance and simplicity, with every detail embodying thoughtful luxury, including 300 thread count cotton linens and sumptuous bath products from MALIN+GOETZ. The new state of the art Nevaya interactive HD IPTV system offers a selection of over 80 channels, including many international stations and Sky Sports with crystal clear picture quality. Please note that as cots are not available, babies will need to be accommodated in the parent's bed. Located just steps away from Sanderson’s iconic lobby, The Restaurant at Sanderson blends visionary design with an exceptional menu and artisanal cocktails curated by our talented team of mixologists. Just off the legendary Long Bar, this modern continental brasserie serves globally inspired seasonal cuisine that combines inventive technique and the best ingredients with classic British favourites. Sanderson continues to evolve and update its seasonal menu focusing on British cuisine with a continental influence. Retreat to the lush, heritage courtyard garden for dinner reservations or enjoy a lazy lunch inside the iconic Sanderson restaurant to sample this ever-changing seasonal menu. At some 80-feet in length, Sanderson's dramatic, glowing onyx Long Bar is the focal point for energy at Sanderson. Long Bar is light, white and airy and radiates freshness and cleanliness. 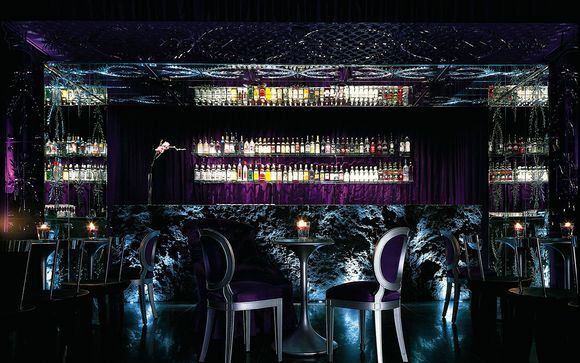 With its veritable symphony of purples, lavenders and violets, this is a chic and intimate lounge that has become one of London’s hottest gathering places. Guests are invited to “tumble down the rabbit hole” and enjoy the wonderful world of tea in the beautiful Courtyard Garden. Their chefs have toyed with the traditional British afternoon tea in the same way that Lewis Carroll played with logic in Alice’s Adventures in Wonderland, creating an afternoon tea filled with numerous gastronomic adventures. A hedonist's delight, the 10,000 square-foot agua spa in London provides pampering, spiritual relief, and tranquility to all who enter. 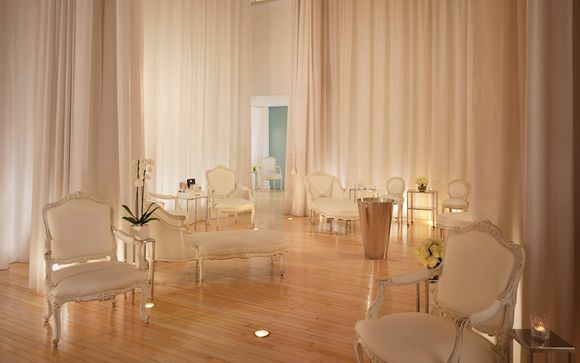 The spa has a dazzling array of rejuvenating treatments combining the best of ancient and modern techniques. With its miles of diaphanous white curtains, 14 all-white treatment rooms, chill-out zone and meditation beds, agua has a peaceful, dreamy and almost cloud-like ambiance. The Billiard Room at Sanderson has a low-key, clubby vibe and features an antique silver-leafed billiard table, whimsical, lodge-like antler furniture and original 1950s stained glass designed by John Piper, one of the most noted British artists of the 20th Century. The dream-like theme continues in the Agua day spa. Billowing white silk – more than 3,000 yards of it – hangs from the ceiling of the two-storey space, creating nooks in which you’ll find comfy cloud-like armchairs. Treatment rooms are hidden upstairs. Consequently, everyone whispers.